Dinings has a reputation larger than its compact Marylebone setting for great (and pricey) Japanese food with innovative flourishes. Booking highly advisable. Once one of Marylebone’s best-kept secrets, Dinings now has a reputation larger than its compact, converted-townhouse setting. 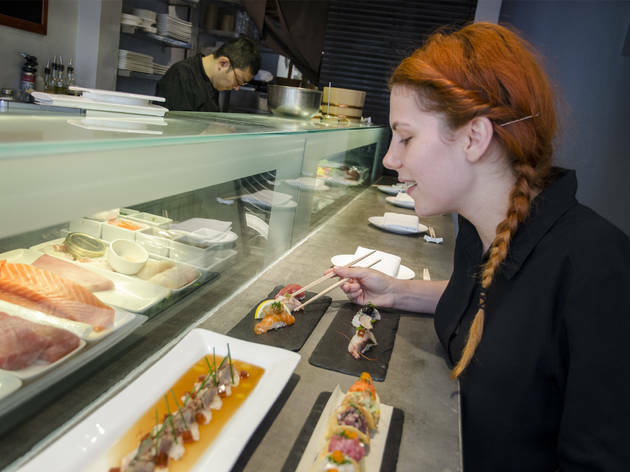 Getting a table in the basement is unlikely without a booking, but if you’re lucky there may be a spare stool at the street-level sushi counter. If you’re not keen on small spaces, then you may just like the ground floor better – it’s brighter with more windows. Whatever your thoughts on the venue itself, the food is indisputably excellent (make sure you’re packing plastic, as costs do mount up). 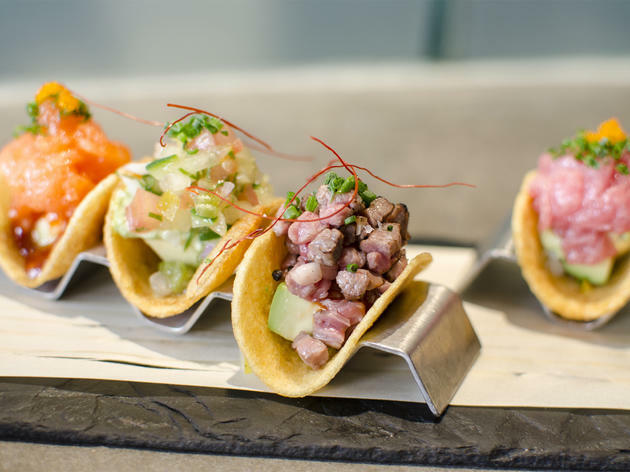 Conceived by Nobu alumni Masaki Sugisaki and Keiji Fuku, it displays plenty of Latin flair along with other innovative flourishes. Nobu-esque curved potato ‘tar-tar’ chips filled with minced fatty tuna, avocado and wasabi/jalapeño sauce offered an inviting taster of the style. 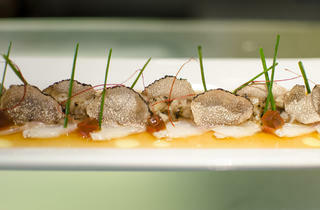 The much-celebrated seared wagyu beef nigiri garnished with cubes of ponzu jelly and minced truffle was also a triumph. Presented on a long platter, a lunchtime sushi selection (good value at £23) tasted every bit as good as it looked. Another lunch dish of pork ‘shabu shabu’ saw ready-cooked slices of tender pork balanced atop a heap of sticky rice and dressed with spicy fermented Korean sauce gochujang – despite the pungent mix, it wasn’t overpowering. 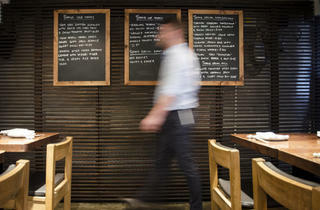 With polite, efficient chefs and waiters too, Dinings is a top performer. Nice food but very cramped surroundings and I agree totally with the comments on not so friendly staff and tiny, expensive portions (some of the starters are actually 4 teaspoons of taster!!). We were still hungry after a "good" and very costly lunch and had to fill up on Lebanese sweets found just down the road. Food is a bit different and very tasty but don't go if you're hungry. Extremely expensive and staff not that friendly. The 6-28 pounds that tiimeout says for a main course is for a single bite, not for a main. Portions are tiny. Spent seventy pounds each for nice, but not amazing food. Then went home and had dinner. First of all food and service were great! The dishes were original and most of all delicious but the prices were way too high for the portion served. Also some dishes had just too much salads, to make them a little more "full" I suspect. I just can't have that amount of spring onions. My first impression wasn't very good, the place looked very shabby already from the outside and inside it was even worse. The table were all ruined, the atmosphere was of a cheap restaurant. Special of the day written on a tiny whiteboard visible just to some guests. I organised a romantic date and I found myself in a very casual environment, too close to the couple next to us. 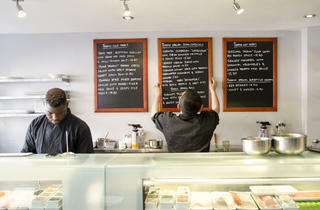 Stellar seafood, sushi and sashimi often follows a rather hefty price tag in London and Dinings is no exception. 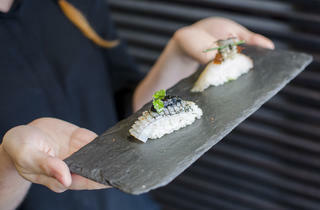 This small unassuming restaurant is tiny and serves its own brand of Izakaya-European inspired small plates and dishes. The space is very small and rather cosy, making it rather tight for staff to navigate around tables and people. Given the price point and fine dining intention, Dinings felt rather cramped and the service flustered and rushed; giving off an atmosphere notedly opposite of the intimate fine dining impression I had and actually one which reminded me more of an EatTokyo with a much fancier menu and dimmer lighting. Our waiter, unfortunately, didn’t tell us that we had a set number of hours for our booking upon being seated, which resulted in us feeling like we were rushed out of the restaurant. So service and table planning needs work. 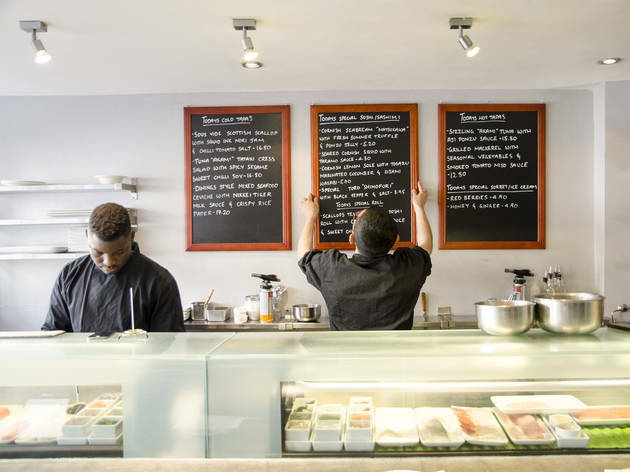 Dinings doesn’t offer an omakase, which, considering the context of a lengthy menu, pacing and space issues and staff pressure, they could really benefit from. That aside, the food itself was delicious. The hamachi yellowtail is a one-bite tartare in a taco and was crispy and fresh; however, I would’ve liked more heat in the jalapeño mayonnaise. The black cod was a little disappointing in flavour, but was delicately cooked and wasn’t overcooked. The tempura was as expected - light, crunchy and moreish; and not over battered. The miso aubergine was definitely worth getting - it’s sweet and savoury and has almost become a paste. It would have gone down really well with a simple bowl of rice. All of the sushi here is solid; however, I would say the highlights would be the scallops and the wagyu beef with truffle salsa and ponzu jelly; oh and of course o-toro; which I can never say no to if it’s on the menu. The matcha crème brûlée was also nice - with a good spoon crack and a good dessert to share, though I’d have wanted a stronger matcha flavour.I’m an avid sushi and sashimi addict and being from Sydney, I really miss being able to get stellar seafood and sushi and it not be extortionate in prices. 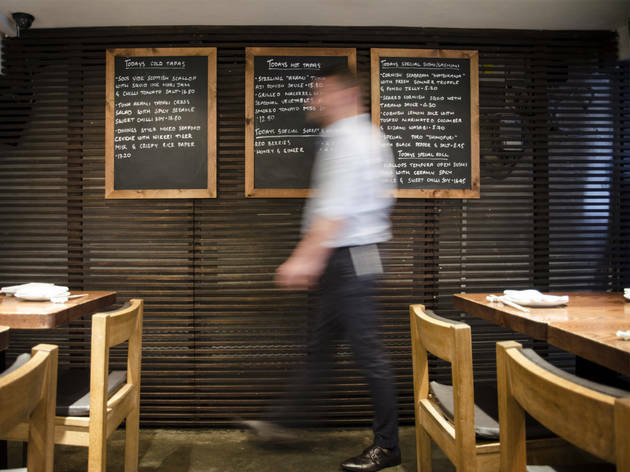 I think Dinings suffers from what a lot of small local restaurants that become famous suffer from - their popularity; and therefore their authenticity to themselves and their focus on what experience they want their diners to have gets a little lost. Having said that, it would be interesting to see what it’s like during the weekday at the sushi bar to see if the atmosphere would be different and more aligned with the casual warmth more associated with an Izakaya. Tip: always book ahead for a table, if you’re a bigger group or want more comfortable seating, I would try their SW3 branch. If you’re unsure what to have - as it is an extensive menu to pour through, I’d recommend giving the waiter a budget per head and ask them to make an omakase at the chef’s recommendation. 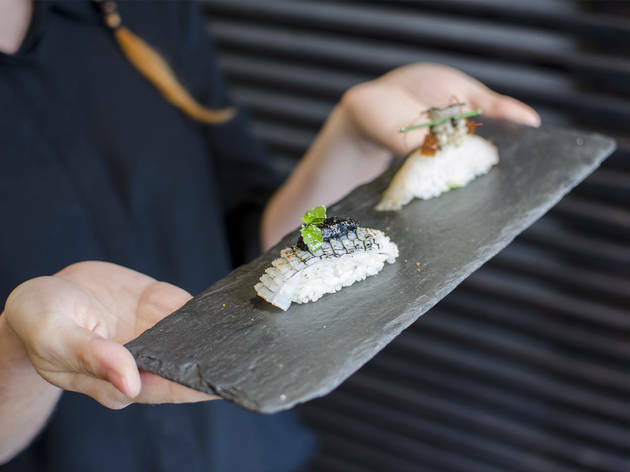 Simple and elegant decor, delicious food and excellent service: Dinings offers fine modern Japenese cuisine in the heart of Marleybone. Located off the beaten track on a quiet side street, this cozy underground restaurant blends traditional Japenese with modern European cuisine for a very tasty night out. The food is tapas style and you are advised to pick a few dishes per person and share. The Scottish scallops with truffle oil and pomegranate were delicious and the black cod creamy, smooth and simply a delight for your tastebuds. 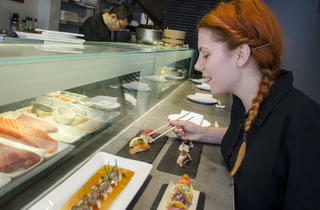 The menu has a range of hot and cold tapas as well as the usual sushi and sashimi selection. Booking is advisable as this tiny venue tends to get quite packed especially on weekends. It is also not cheap but worth it if you are looking for a nice dining experience. SO, SO expensive. Tiny, cramped seating area. Tiny portions. But the food. Ohhhhhhhhh the food. Fresh and delicious. I am still thinking about the miso aubergine, served steaming hot. A rich, aubergine half crackling with miso paste. That was the most decent-sized option out of all the food I ordered. The next were the tofu croquettes. Served hot as well, with a melty interior. A great starter. The scallop "bite" (for nearly 4 quid!!) 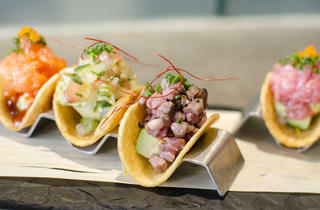 is just that- one swallow, diced scallop in a tiny taco shell. Innovative and tasty. Just a note, when you enter ALL the staff says hello in Japanese, which is discombobulating. I love eating out but I don't necessarily enjoy paying for it (who does?). For Dinings I happily make an exception though. It is not cheap, but the food is of such a tremendous quality that by the time the bill comes I am on such a food high, I don't even care that I'll have to eat crackers for the rest of the month. Dishes are inventive, yet the dining room is very basic. 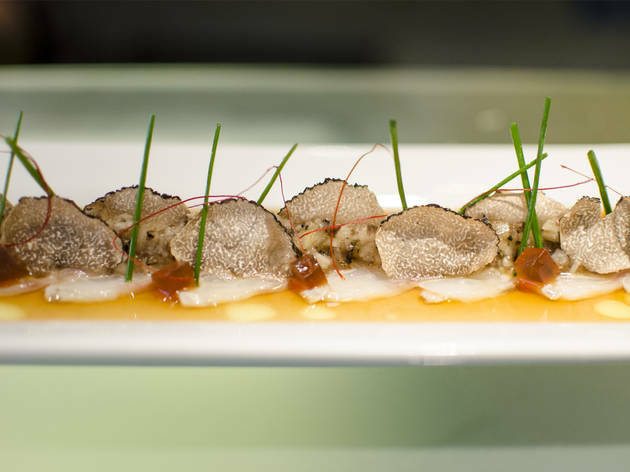 This allows customer to enjoy exquisite food of michelin star quality in a very welcoming and relaxed atmosphere. The restaurant is difficult to spot from the outside which makes it one of Marylebone's best kept secrets, though it has been around for years. Away from the hype and media circus surrounding other Marylebone institutions, Dinings has consistently been serving ridiculously good food whilst keeping a low profile. The space is tiny so make sure to book ahead! This place is amazing! The restaurant is easy to miss and located on a quiet little street. Inside, it is completely understated. Most seats are in the basements which isn´t exactly too pretty, but you´ll forget the surroundings when you try the food. Everything we had was exquisite and had a twist to it. Lots of delicious variations of toro (fatty tuna) and Wagyu beef. 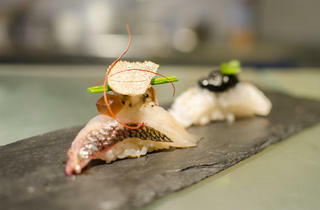 The Seared Wagyu beef sushi topped with truffle salsa and ponzu jelly was my absolute favorite! Fantastic Japanese food, understated restaurant. Yes the place is small and not flashy and expensive, but the food was brilliant. 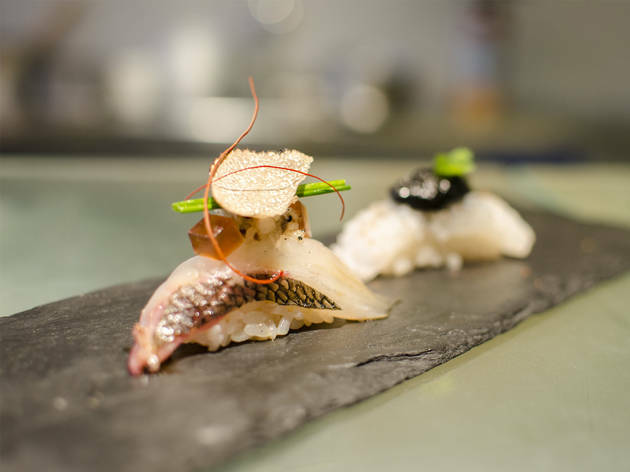 Great flavour combinations, excellent sushi, creative and beautifully presented. Loved it. Amazing food and great service. It could possibly be the best Japanese restaurant in London, I've tried many! Best Japanese restaurant that I tried so far in London! The tapas concept is amazing, you will be able to try different things for an amazing experience. Of course it is expensive, as every good restaurant in London. Definitely worth every penny! Inspired, delightful food with enough originality to make a highly recommended place. Tried Dinings a few weeks back and we were somewhat disappointed. Not one dish stood out as 'amazing'. Do yourself a favour and spend your money at Nobu instead! I've been twice now and this has become my sushi splurge of choice. I used to swear by this place as being one of the best Japanese in London and perhaps in Europe. Alas, commercialisation has got to them and now the high prices do not warrant a visit to a basement dive. Worse still, the quality of the food had gone down dramatically and some of their best dishes are no longer on the menu. A real shame. Best sushi I've had in London - and i've had a fair bit.